Today we are back discussing Pinterest myths with Alisa Meredith. Some of you remember that Alisa and I have talked about this before in this “Pinterest Mythbusters” episode. You’re building a business and using Pinterest to help market that business. You don’t have time to mess around with rabbit trails or elements that distract you (ain’t nobody got time for that). You want to get in, make an impact, create content and products. So we asked my Facebook group to share a Pinterest myth they have heard and we would shed light on whether it’s fact or fiction. The thread really turned into an “ask anything” so we hunted the “myths” and “bust them” during this episode. Before we dive into the first myth, I want to make you aware of the best practices guide for Pinterest success. Pinterest does change things up every once in a while, so this is a page that you want to have bookmarked on your computer in order to keep up with the changes. The first 5 Pins you save each day will be prioritized for distribution. Save to the most relevant board first. It started a bit of a firestorm of questions and confusion. We’re going to try and clear it up for you. First, the “start of the day” on Pinterest is midnight UTC. You can Google “midnight UTC” to find out what time that would be wherever you live. How do you pin at the beginning of the day if it’s the middle of the night? How much emphasis should you really be putting on this? You can use Tailwind to schedule your pins and set the time. But it’s important to know that the new follower feed is the reason they made this change. Pinterest is breaking up the follower feed into little chunks so that you see different pins from the people you’re following instead of 200+ pins from the same person in a row. How important are followers going forward? It seems like this is being emphasized again with the new “follower” button. Followers do matter, but they are not as important as you think. It’s not the number of followers that matter, but the engagement. Pinterest pays attention to how engaged your followers are with your content. You want an authentic audience. Related: Do Pinterest Follower Numbers Affect Page Views? Pinterest just released the new profile look for business accounts. It’s beautiful and we are super excited about it. There’s some confusion about the number of monthly viewers prominently displayed in the new profile view. The question people have is: is this something people should pay attention to or be worried about? It’s just the number of people who have seen your pins in the last 30 days. The purpose is so that you and the people visiting your profile can see just how far your influence extends to Pinterest. You should post this amount of pins per day or follow this amount of people per day. Pinterest is looking for consistent daily activity. As long as you’re keeping things relevant and spreading out your pins, you’re good. They want fresh content. So if you’re pinning the same things over and over, you’re not going to get the return you would like. Create multiple images for one piece of content and pin your new content as soon as possible after it’s published. A lot of people feel like they have to go back through and update all their pins since Pinterest has changed up the sizing on images. The ideal size for a vertical pin has always been 600 x 900. The confusion started when Pinterest tried to eliminate confusion. The only thing that has really changed is that pins longer than 1260 pixels will be cut off and not shown as much in the smart feed. Determine which kind of images your audience likes most. You can do this through trial and error or A/B testing your Pinterest images. 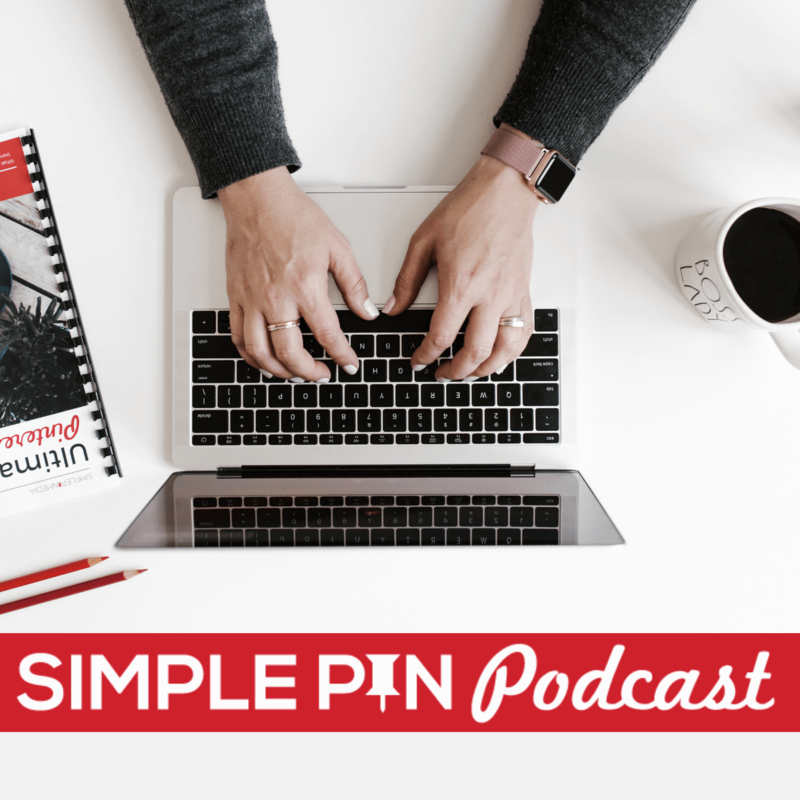 Another myth is that if you use the same pin description on several pins, Pinterest will penalize you. They didn’t say this, but they did encourage the use of different descriptions to improve your SEO (search engine optimization). You must join group boards to get anywhere on Pinterest. Who is making up these myths?! Well, we already debunked this one for you in our Understanding Pinterest Group Boards podcast. Go listen to that episode and it will answer any questions you have on this topic. Having rich Pins enabled will it negatively impact traffic. This myth comes from people thinking that users will look at the information on the pin instead of following it to the site (for example, using the recipe on a rich pin instead of clicking over). It would be hurting your traffic if it were true. We have not seen rich pins negatively affect traffic. When you provide a good user experience, you will be rewarded. Look at your user habits and see if they’re clicking over. Use our KPI worksheet to help you understand what you actually need to be concerned about. There was a statement made recently that Pinterest allows stolen content and does nothing about it. While we don’t want to dive too deeply into this, we just want to say that Pinterest does not allow it (it’s a bot issue). Every social media platform has had this problem before. Pinterest has said that if you find your content stolen, send them an email with the content. We do know that Pinterest is taking legal action against offenders, but that’s all we know at this point. What are the similarities between buyable and promoted pins? Buyable pins are pins that allow you to purchase right from the platform. Promoted pins are just advertisements on Pinterest, but you can promote a buyable pin! Do people actually make sales with buyable pins? We don’t have a ton of experience with buyable pins, and there aren’t really any good statistics available. But knowing the typical Pinterest user, we doubt many of them are using buyable pins. Will promoting a brand new pin always cost more than letting it gain traction organically? It’s all based on your targeting. If you and a million other people are targeting a keyword you’ll pay a lot more than if it’s just ten other people. When your pin does well as a promoted pin, you’re going to pay less. We both highly recommend using promoted pins. How can you get information directly from Pinterest? Pinterest hasn’t just openly shared a ton of information over the years, so it often feels as though we have to investigate to find it. But they have done a much better job of updating us recently via their blog . Keep in mind that Pinterest built their platform for pinners and consumers, not content creators. So any updates and information that they choose to share with us is icing on the cake. You can find more information about Alisa and Tailwind by going to the Tailwind Blog. 1:00 – Why Discuss Myths? Do you know why this isn’t viewing on the Podcast app for iPhones? Never had this problem before. Love the podcast! This episode isn’t showing up in Pocketcasts or Google Music, thought you should know! I just discovered your podcast and this was my first episode. Loved it! Very informative and I look forward to listening to more from you!